What better time than mid-October for a trip up to the Finger Lakes? Our Advanced Surface Processes class spent a long weekend studying the waterfalls and channels around Seneca and Cayuga Lakes. Some students made measurements of rock strength, fractures and bedload volume and size. My partner Evan and I decided to study how the stratigraphy affects the location and morphology of waterfalls. Evan is a stratigrapher and I’ve had experience with bedrock streams,so we were well-equipped! We also both used photogrammetry in the past so we decided to make models of the stratigraphy and waterfalls with Structure from Motion in addition to traditional stratigraphic measurements. 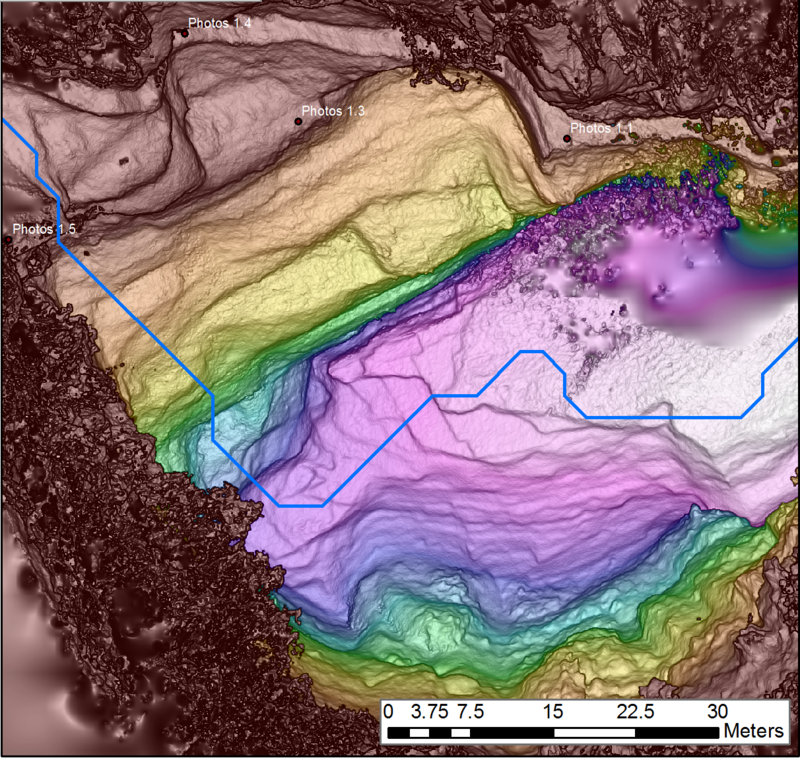 Right now we’re in the process of reconciling our field measurements via laser ranger, orthorectified mosaics and LiDAR. But I also took the time to build a whole model of Lucifer Falls, the big drop in Treman State Park near Ithaca. 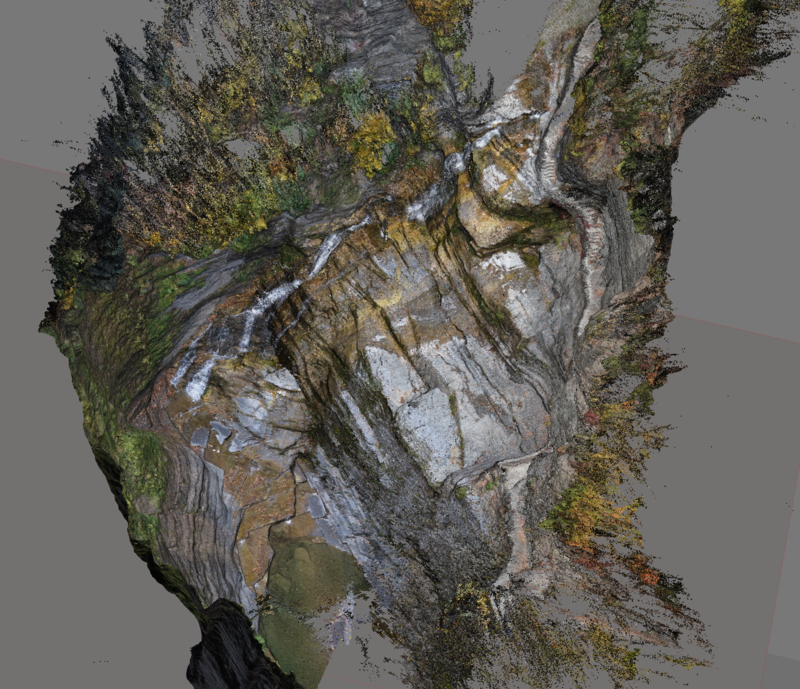 …and this is what the colorized, georeferenced point cloud looks like when you use photos from lots of different angles to create a model in Agisoft Photoscan! We can upload the dense cloud directly to a program like Cloud Compare to make measurements of fracture orientations or spacing. I’m using the model to cross-check our measurements we made in the field and the NY state 2 meter LiDAR. I also used Photoscan to create a DEM from the dense point cloud. It’s a little funny lookin’ with the trees in the way, but I’ve zoomed into the gorge part of the DEM with the photolocations as well as the stream network derived from the 2m LiDAR. Ain’t it beautiful?